It was a rare scenario in local music and in the history of national heroism. 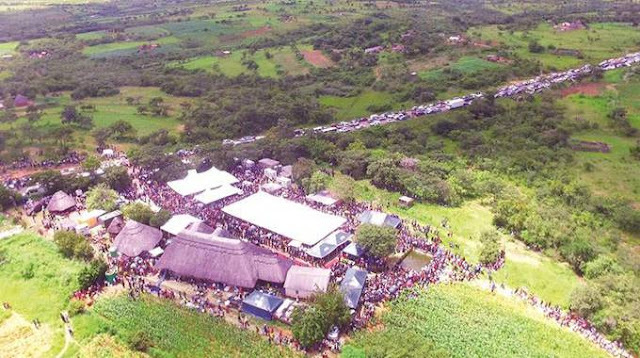 The Bindura-Mt Darwin highway was a sea of colours as thousands of people gathered at Oliver Mtukudzi’s homestead in Madziwa, Mashonaland Central province. Mtukudzi’s fans came from all walks of life to bid farewell to their hero. He was the first musician to be declared a national hero and his burial in Madziwa as per the wishes of his family did not deter people from showing their love to the man who made history in the country’s showbiz scene. The activities in Madziwa began on Saturday night when a contingent of the musician’s followers arrived from various parts of Mashonaland Central. Others came from Harare and Norton to salute their hero. Mashonaland Central was Tuku’s home province. His fans from areas like Shamva, Bindura, Mt Darwin and Rushinga made sure that they gave their hero a befitting farewell. Music lovers from all walks of life also gave Tuku a memorable send-off. A stage was set about 200 metres from the musician’s homestead. As people trooped in to pay their last respects, attention shifted towards the stage at around 9pm on Saturday. Musicians took turns to salute Tuku with energetic performances and the homestead reverberated to song and dance. It was an excellent way of saluting a hero who had shown great artistry on stage. Yesterday morning saw all roads leading to Madziwa and with numbers swelling, parking became a challenge as vehicles continued to extend for several kilometres on both sides of the highway. Musicians, politicians, sportsmen, entertainers and villagers gathered for merrymaking. Celebrating a hero and a superstar who has left an indelible mark. Instead of shedding tears, many decided to celebrate his life and share their experiences with him. Burial proceedings began towards mid-morning with Tuku’s widow, Daisy, giving a touching speech. She revealed how the departed hero made a mark in her life and how his hardworking culture has been passed on to the family and musicians after him. Family spokesperson Victor Rukainga revealed how Tuku began his career. He said the musician was in love with his art and began playing homemade guitars when he was young. “He started playing guitars made out of ‘Olivine’ tins. I knew that he had the talent because of his passion for music. When he got a job, he bought a good guitar with his first pay,” he said. “His parents did not know that he was doing music. He tried to hide it because it was not acceptable to pursue music. He revealed that the Municipality of Bindura at one point disappointed Tuku when they failed to avail an appropriate place for him to build his arts centre. Pakare Paye Arts Centre, which is in Norton, was meant to be in Bindura, but the authorities were not co-operative. The family spokesperson then called Mtukudzi’s daughters to the podium. Sandra Mtukudzi said her father taught them the importance of unity. She saluted her mother Melody Murape for inspiring them to work hard even when things seemed bleak. Selmor Mtukudzi then led her sisters and mourners in singing “Mumweya Nemuzvokwadi”. Alick Macheso was then given a chance to salute Mtukudzi on behalf of other musicians. Macheso said Tuku was a father in the music industry and they had worked together on a number of projects. He said he has taken advice from his elders Tuku, Thomas Mapfumo and Nicholas Zakaria. Macheso did a rendition of Tuku’s song “Tichasangana Kudenga” and this moved mourners who joined in. Then it was time for Neria’s lead actress Jesesi Mungoshi to say a few words about the departed hero. As she took to the podium emotions got the better of her, after regaining her composure she told the crowd about how the late musician was her source of inspiration. Dub poet Albert Nyathi did a poem to salute the late hero and many people applauded his celebratory words that showed his poetic prowess. Guest of honour was Defence and War Veterans Minister Oppah Muchinguri-Kashiri, who read President Mnangagwa’s speech and highlighted how Tuku preached unity in most of his songs and urged young musicians to emulate him. She said Tuku led by example when he sang “Hatidi Hondo”, which is a call for peace. When people had saluted Tuku through speeches, it was time to lay the hero to rest.